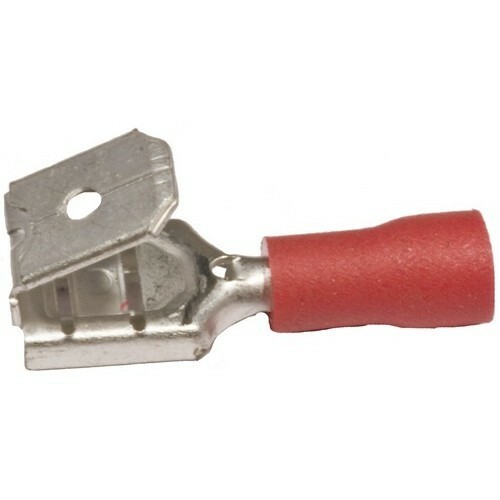 Nylon Fully Insulated Double Crimp Female Disconnects - 16-14 Wire, .032x.250 Tab - Our Nylon Insulated Double Crimp Female Disconnect combine quality and economy. Nylon Fully Insulated Disconnects Male - 12-10 Wire, .250x.032 Tab - The Male Disconnectors are Nylon-Insulated. 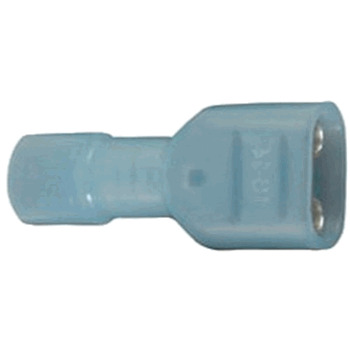 INSULATED BULLET SPLICE CONNECTORS Quick & reliable insulated bullet splices Available in pairs or male / female only Rated at 600 volt max Temperature rating: 167 degrees F. 0.156" tab Color coded by wire gauge UL Listed and CSA Certified 20-161P 22-18 MALE/FE DISCONN GAUGE/COLOR:22-18 / Red DESC:Pairs / 10/Pk. 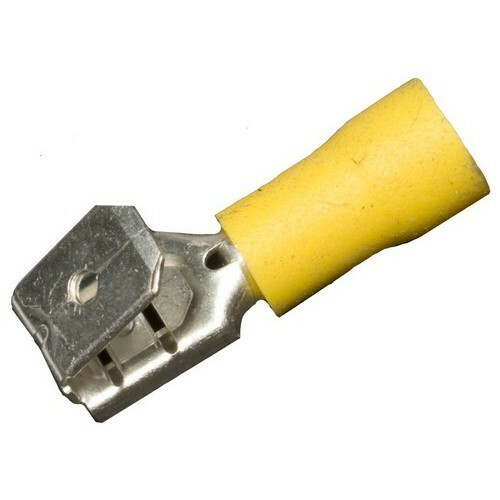 Vinyl Insulated Female Disconnects - 12-10 Wire, .032x.250 Tab - Female Vinyl Insulated Disconnectors for electrical work. 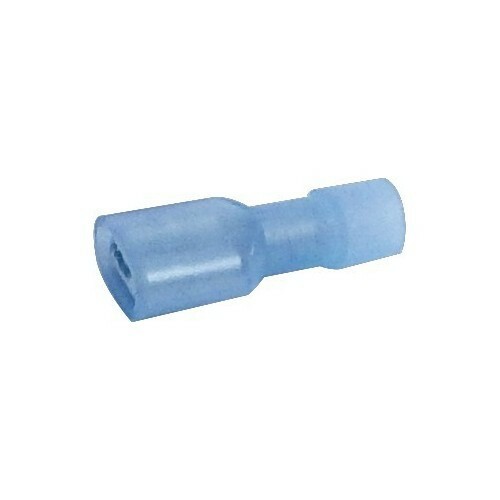 Vinyl Insulated Female Disconnects 25 Pack - 12-10 Wire, .250x.032 Tab - A refill pack of Vinyl Insulated Female Disconnects. 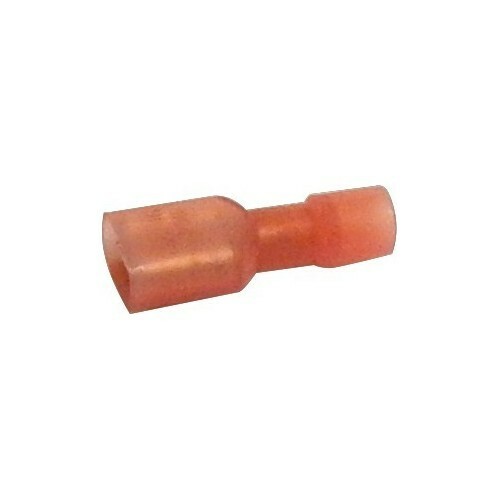 Vinyl Insulated Female Disconnects 25 Pack - 16-14 Wire, .250x.032 Tab - A refill pack of Vinyl Insulated Female Disconnects. 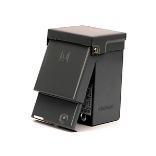 This 2 Pole 4 Wire Luminaire Ballast Disconnect enables fixture manufacturers and contractors to comply with the NEC 410.73 (G) & CEC 30-308(4) requirements for a means to safely disconnect non-residential fluorescent fixtures while under load. Qty: 25 This item does not ship to APO/FPO addresses. 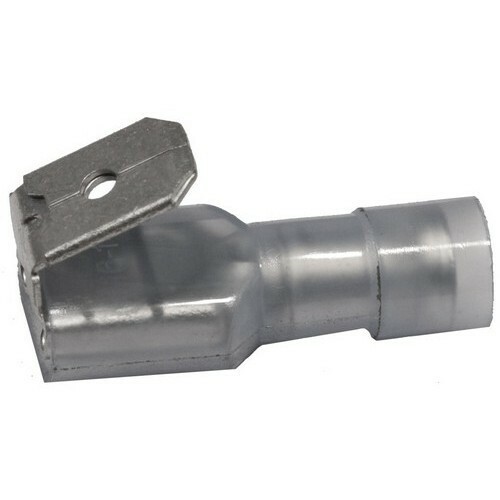 Vinyl Insulated Bullet Disconnects - 22-16 Wire, .157 Bullet - Our Vinyl Insulated Bullet Disconnectors combine quality and economy. 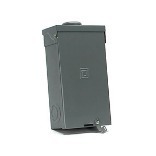 This 2 Pole 2 Wire Luminaire Ballast Disconnect enables fixture manufacturers and contractors to comply with the NEC 410.73 (G) & CEC 30-308(4) requirements for a means to safely disconnect non-residential fluorescent fixtures while under load. 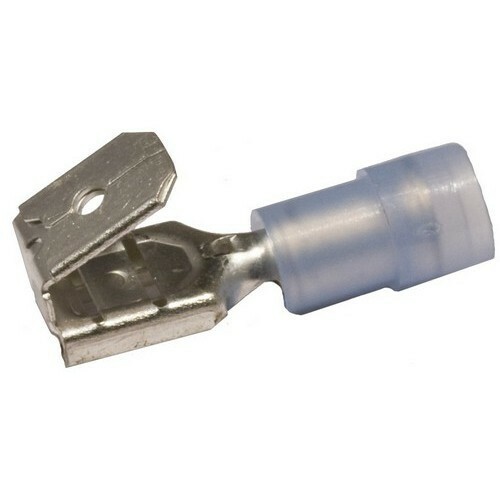 Vinyl Insulated Piggy Back Disconnects - 12-10 Wire, .032x.250 Tab - Restock your Vinyl Insulated Piggy Back Disconnectors with us. 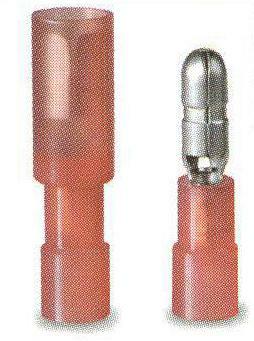 Nylon Fully Insulated Disconnects Female - 12-10 Wire, .250x.032 Tab - The Female Disconnectors are Nylon-Insulated. Non-Insulated Flag Female Disconnects - 22-16 Wire, .032x.250 Tab 1 Flag - These Female Disconnectors are Right and Non-Insulated. 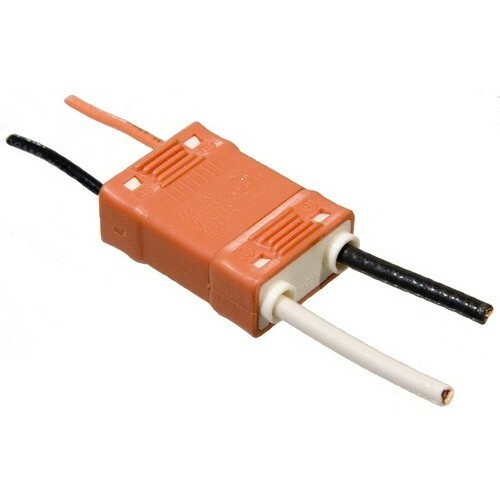 Nylon Fully Insulated Double Crimp Receptacle Disconnects - 22-16 Wire, .154 Receptacle - You'll love working with our Nylon Fully Insulated Double Crimp Receptacle Disconnects. 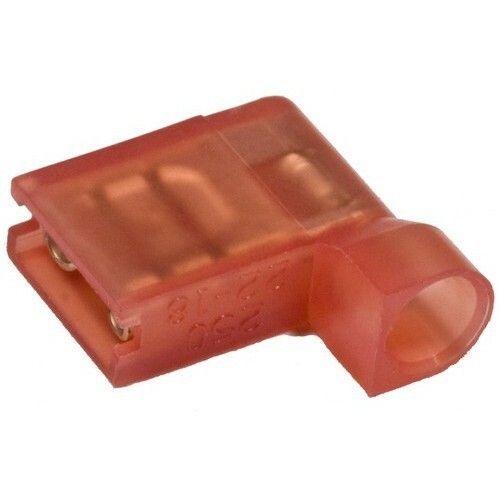 Nylon Fully Insulated Double Crimp Piggy Back Disconnects - 22-16 Wire, .032x.250 Tab - These double crimp Piggy Back Disconnectors are Nylon Fully Insulated. 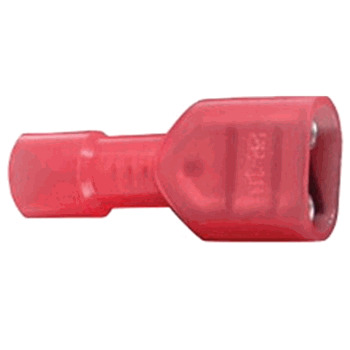 Nylon Fully Insulated Right Angle Flag Female Disconnects - 12-10 Wire, .032x.250 Tab - A quick way to restock your Nylon Fully Insulated Right Angle Flag Female Disconnects. 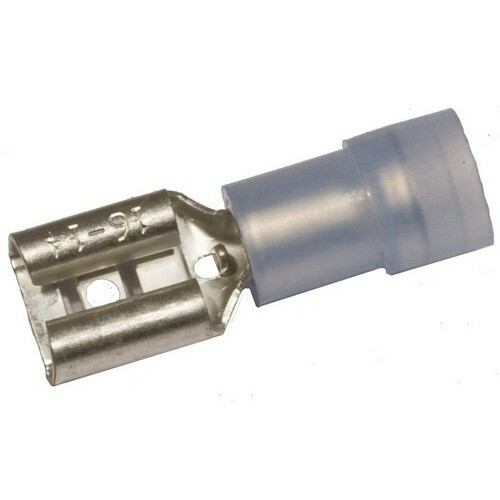 Nylon Fully Insulated Double Crimp Male Disconnects - 22-16 Wire, .032x 250 Tab - You'll love working with our Nylon Insulated Double Crimp Disconnectors. 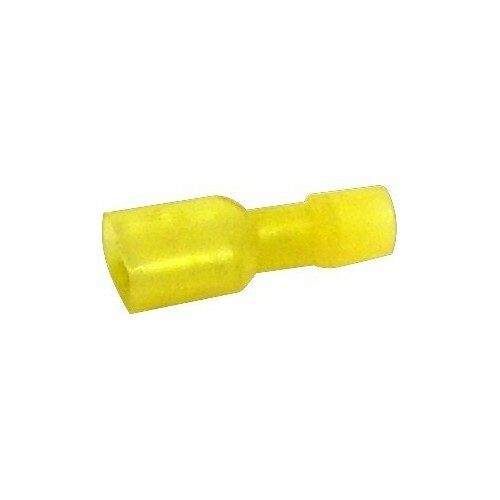 Vinyl Insulated Female Disconnects 25 Pack - 22-16 Wire, .250x.032 Tab - A refill pack of Vinyl Insulated Female Disconnects. 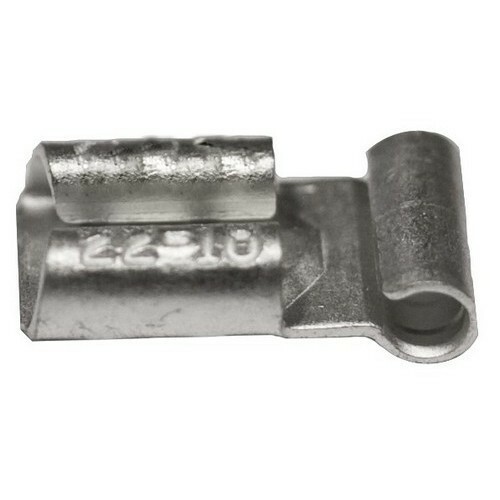 Nylon Fully Insulated Right Angle Flag Female Disconnects - 22-16 Wire, .032x.250 Tab - A quick way to restock your Nylon Fully Insulated Right Angle Flag Female Disconnects. 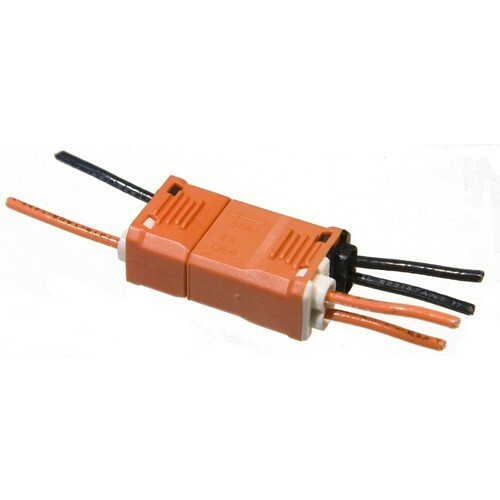 Nylon Insulated Double Crimp Piggy Back Disconnects - 12-10 Wire, .032x250 Tab - Nylon Insulated Double Crimp Piggy Back Disconnectors for electrical work. 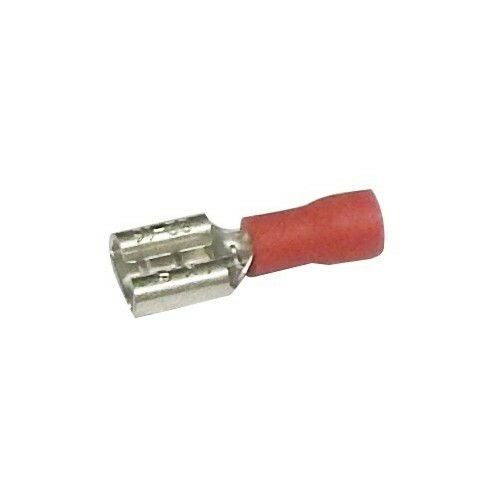 Vinyl Insulated Female Disconnects - 22-16 Wire, .032x.187 Tab - Female Vinyl Insulated Disconnectors for electrical work. 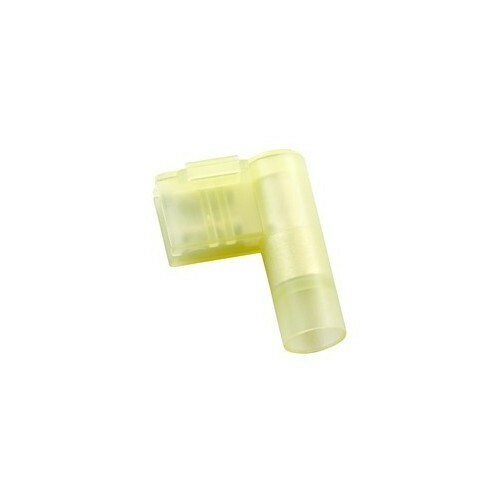 Nylon Insulated Double Crimp Female Disconnects - 16-14 Wire, .032x.250 Tab - Resupply your Nylon Insulated Double Crimp Female Disconnectors. 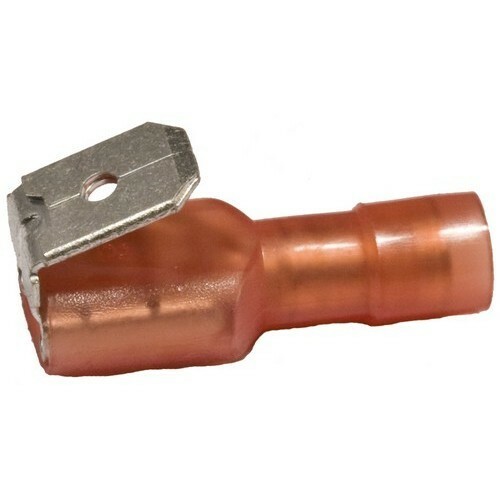 Vinyl Insulated Female Disconnects - 12-10 Wire, .020x.187 Tab - Female Vinyl Insulated Disconnectors for electrical work. 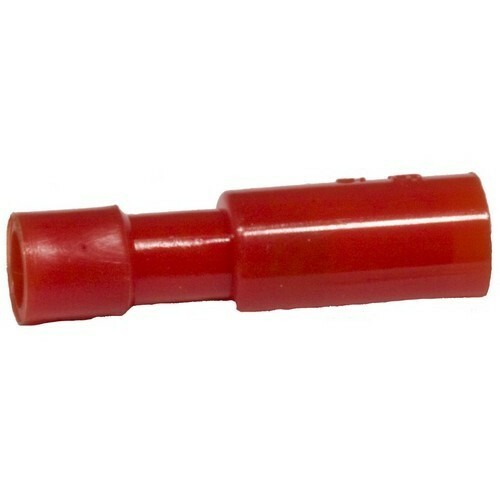 Nylon Fully Insulated Double Crimp Piggy Back Disconnects - 16-14 Wire, .032x.250 Tab - These double crimp Piggy Back Disconnectors are Nylon Fully Insulated. 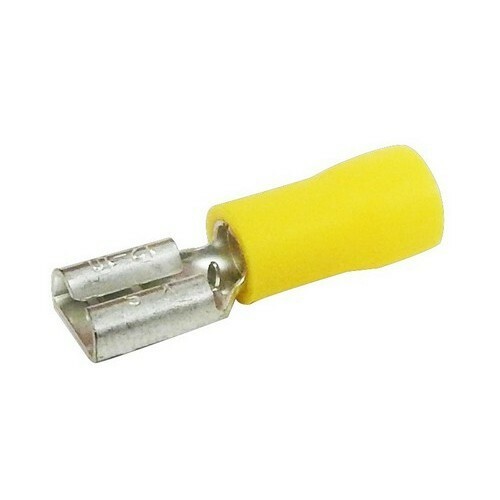 Nylon Insulated Double Crimp Piggy Back Disconnects - 16-14 Wire, .032x.250 Tab - Nylon Insulated Double Crimp Piggy Back Disconnectors for electrical work. 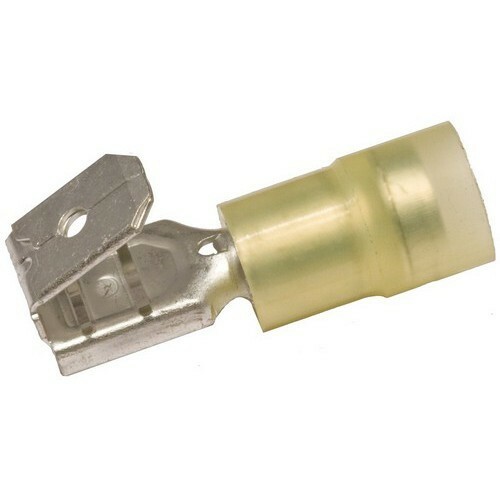 Vinyl Insulated Piggy Back Disconnects - 22-16 Wire, .032x.250 Tab - Restock your Vinyl Insulated Piggy Back Disconnectors with us. 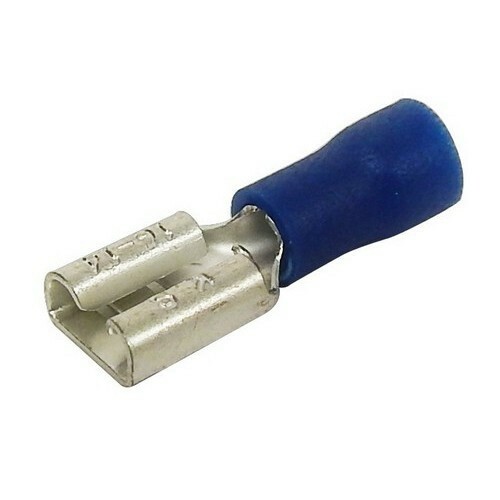 Vinyl Insulated Female Disconnects - 16-14 Wire, .020x.187 Tab - Female Vinyl Insulated Disconnectors for electrical work. 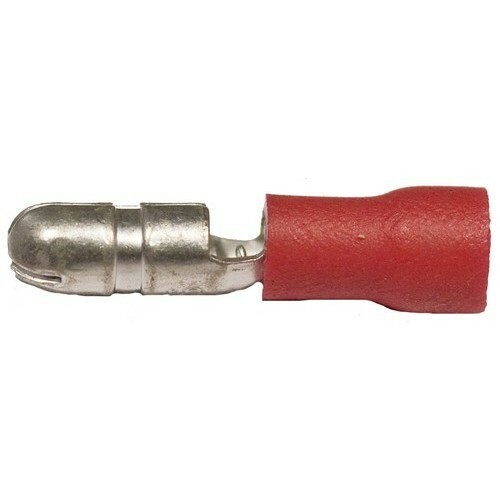 Vinyl Insulated Female Disconnects - 16-14 Wire, .020x.205 Tab - Female Vinyl Insulated Disconnectors for electrical work.